Etsy takes pride in being unique in everything it does, including its inventive idea of being a third party seller for individual sellers with guaranteed safety with your information while purchasing. Anyone can start off selling on Etsy, but the marketplace structure focuses on the value to “keep commerce human” through an e-commerce store provides an innovative approach to blending technology and human trades to produce high quality to customers on a transparent platform, providing a creative arena that can also prove to be lucrative as a seller and a great way to find special shopping items as well as everyday ware that supports a positive business and entrepreneurs. Etsy provides progress reports on their business and to maintain how they are delivering their mission statement to their employees, customers, and sellers which sets them apart in their blatant honesty within their business and products. Ranging from clothing, shoes, and accessories (both vintage and modern) to home and living decor, wedding/party supplies, crafts, and arts, Etsy’s shops for sellers boast a wide range of categories to fit almost any shopper’s interests and needs. Similar to how Ebay works, by clicking on a category Etsy makes it easy to filter and shop through different sellers and has a detailed search engine to narrow down which shops might have that special item you are looking for. to use when making your purchases on Etsy. 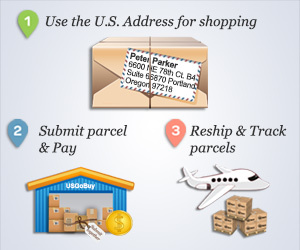 After the checkout process is complete, your items will then be sent to the USGoBuy warehouse in Oregon where any details about your shipment can be added before paying for shipping and handling fees. Paypal and most online third party transaction sites are acceptable. Your items will then be shipped directly to their final destination for your enjoyment! While Etsy bargains and sales are up to each individual seller, there are always plenty to come by and Etsy features a sales category to rummage through the savings! Holidays always offer plenty of steals available and Black Friday is no exception. Most sellers advertise any sales or offers before the big day, so be sure to stay on the lookout so as not to miss out! Etsy will also keep track of recent purchases for you to help make recommendations for future sales. Subscribing to their email will allow for custom designed suggestions to come straight to your inbox after registering. Any problems with sellers can easily be dealt with Etsy through their customer service department that is always readily available through their help center if contacting the seller outright hasn’t been successful. “We make it easy to find your thing” is the motto here at Etsy and they stand by their words with both their customers and their sellers through their innovative platform that provides creative, quality products for perusing and purchasing. Buy from US online stores of Etsy and ship 60% off to your country, register now!